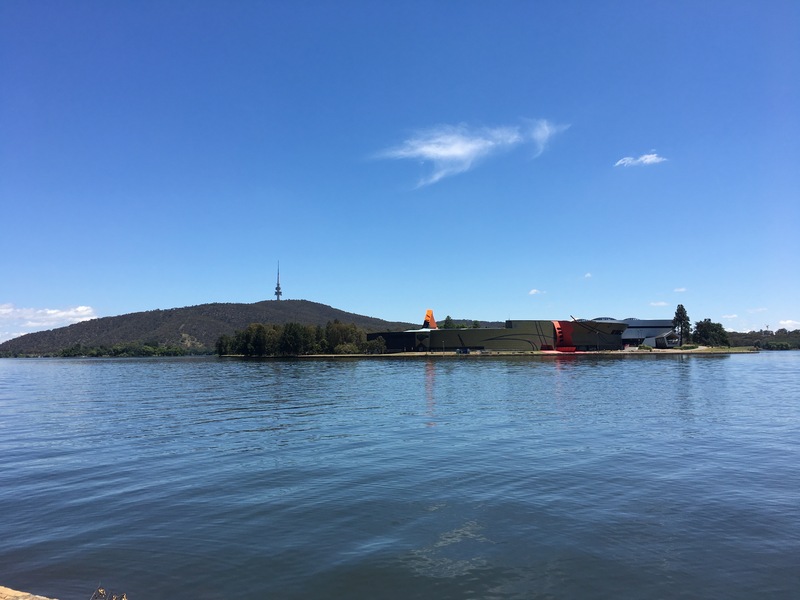 We visited Canberra the first week of January. The aim was to see the city, as I am fan of planned cities, and see the museums, and provide some education to the kids along the way. Canberra was planned by the American Walter Burley Griffin (inventor of the carport) and his wife (his wife has a name of course, Marion Mahony Griffin, an architect in her own right, but she was not generally credited, though apparently was very important in the design process). Walter Burley Griffin apprenticed with Frank Lloyd Wright in his Oak Park days, and while Wright’s later Broadacre City was never actually built as such (though in another important sense, it defines America), Griffin did get Canberra off the drawing board to realisation. To get to Canberra we took the train. We ticketed from Redfern to Canberra, though the Sydney train departs Central and doesn’t stop at Redfern on its way out, so we walked to Redfern, caught a train to Central (without tapping in on Opal, since we were ticketed), fortunately, you can get from our platform to the trains without tapping out, so we just transferred, and then backtracked past Redfern on the way to Canberra. The train was on time, if a bit slow. It is a Diesel. Once we got out of Sydney, the path was especially winding. (The cost was about $AU200 roundtrip for 5 … the kids were basically free). Australia has many fine, lovely Victorian or Federation era small (1 or 2 platform) train stations. Canberra (Kingston) train station is not one of them. It is straight out of Amtrak. The advantage of taking the train was not having to rent a car and drive, saving money on the rental and fuel. It also gives an opportunity to see the countryside, and for the kids to have a chance to ride an Intercity Train. The train had a buffet car (a section of the first class car), so food could be ordered in motion, but you brought it back to your seat (not a full traditional dining car experience). The food was cromulent, but relatively inexpensive. The downside of taking the train was no car in Canberra. We walked, and as needed, Ubered instead. (We attempted taxi, but they couldn’t give us a ride for 5 in one car, nor quote us a price to our city hotel.) Not driving was probably a minor strategic error. The tourist board also doesn’t advertise the unwalkability of the city. 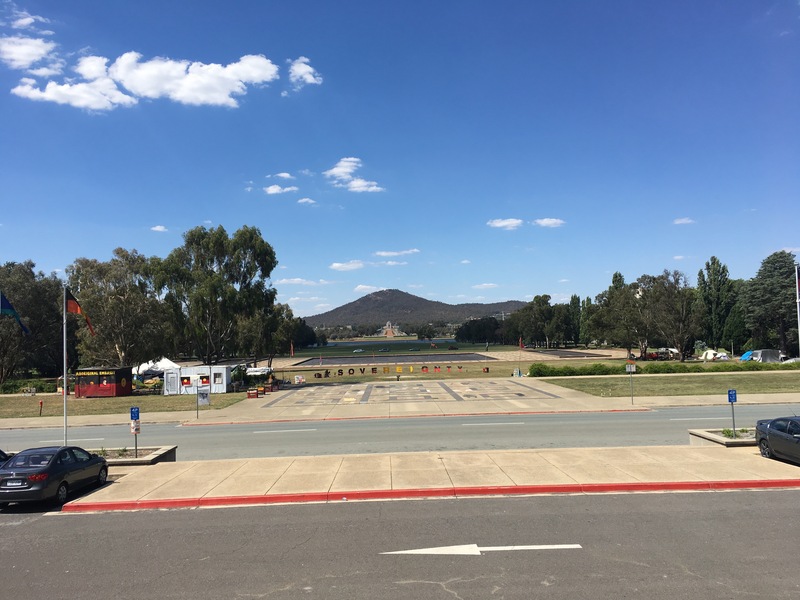 To the best of my knowledge, before our trip, no one had ever walked in Canberra. There are some bicyclists, they mostly ride on the sidewalks, which like the bike lanes, are an afterthought. The plan is lovely; from a bird’s eye view it is elegant. It looks organic, centered on Lake Burley Griffen, named for the town’s planner. It is not organic however, as plans never can be. An organic town grows from a point outward. (Or in the case of conurbation, from multiple points outward.) Instead it was laid out as a whole with the scale of the motorcar in mind, even given its early date in the deployment of automotive technology. Canberra faces many of the same scaling problems of other 20th century planned capital cities, most notably Brasilia. To be fair, it is a challenge to plan for today’s technologies, and tomorrow’s; for today’s land use needs, and tomorrow’s. But by privileging the future over the present they guarantee the present is dysfunctional and thereby discourage growth. I hate to say “design for today, for tomorrow we may be dead”, but if we don’t design for today, where will the growth come from? Tomorrow can worry about itself. 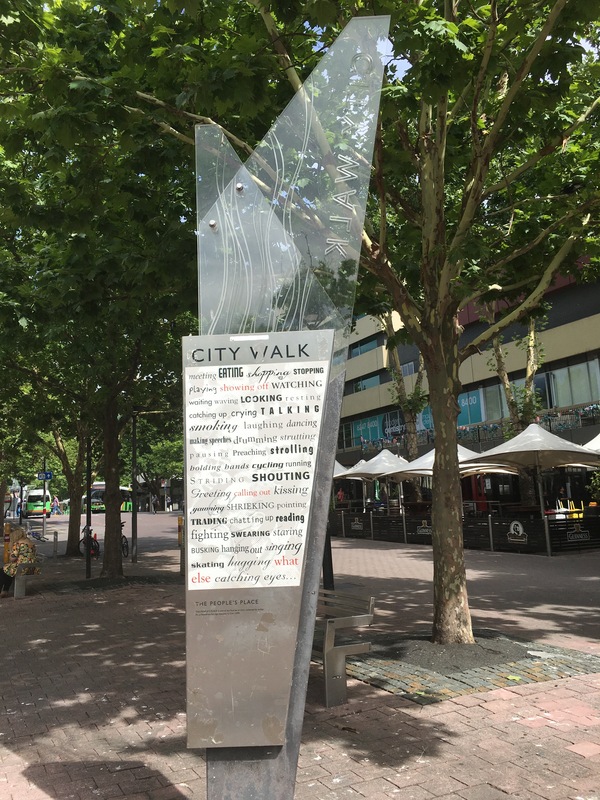 While keeping options open is a good thing, keeping all the land vacant while waiting for the future diminishes the accessibility of the present, as I discuss in my paper: A Random Walk Down Main Street. A light rail line is under construction. While Walter Burley Griffin’s plan called for trams, this never happened, as it was too late in history and by the time the decision was to be made, cities were already starting to remove trams, so Canberra has been served by buses as its sole mass transit mode. This is apparently a good local bus system, but it didn’t seem to take Opal and we didn’t ride it. How much time is someone expected to figure out how to use the system? The light rail may eventually go useful places, but it isn’t yet under construction to cross the lake to the government district. The lake, I might add is large (18km circumference, with a very short (500m?) diameter on the short end, so something like 9km long. This is good for biking, bad for walking. The town is very strictly zoned, so there is a government precinct with just government. There are no restaurants in the government precinct to speak of. We did eat at Snapper on the Lake, which was a fine (if expensive and astonishingly slow) fish and chips establishment. We walked into the City district to eat breakfast at the Pancake Parlour. Which was, as the sign says, ‘lovely’. Indeed they were good pancakes, probably the best in Canberra, perhaps the only in Canberra. We also ate at Mister Zee’s, which was excellent Middle Eastern charcoal chicken. The downtown shopping street (City Walk, Bunda Street) have some activity in the evening. Citywalk is a pedestrianized street. Bunda is a shared space. The mall was on Bunda and it seemed to be doing better (higher rent, more pedestrians, fewer vacancies) than City Walk, but I am not sure the causality here. Day 1: Arrive and visit Questacon – This is a pretty good science museum (with reciprocal arrangements with the Australian Museum and Powerhouse Museum of Sydney, so free if you are members, costly otherwise – museum memberships are good value if you have school age kids and can plan your visits right). It has a lot of hands on exhibits, so is more like the San Francisco Exploratorium than the other Australian museums we have visited. It is not as broad or scientifically in depth, more about the cool optics. But maybe it will get kids interested in physics. 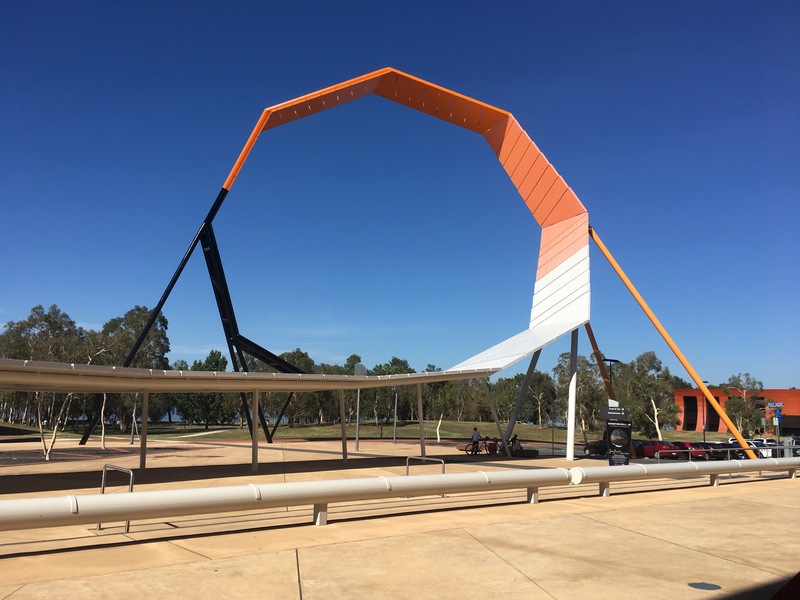 Day 2: War Memorial – This is an excellent war museum, not just a memorial to the fallen of Australia’s many overseas adventures. It forms an axis with Parliament (what doesn’t? ), and sits at the base of Mount Ainslie. There is a nice view of the city atop the mountain. We climbed it the hard way (Thanks Google Maps! That which did not kill us does make us stronger, but it was touch and go there), though there is an easier path that was not well signed or mapped. At the top of the mountain there is a lookout, and a man selling ice cream on a hot summer’s day. Day 3: Visit National Museum of Australia – The building tries to be symbolic and iconic, but really it’s just ick. (Chaotic, Tragic, Formulaic). The architecture tries far too hard, it is doing too many things. It has a visually great location on the lake. It has a functionally terrible location that is hard to get to by any means but car or tourbus. There are at least side paths here, but they clearly do not expect you to walk here from a hotel, that’s just unheard of. The exhibits were fine, a bit of culture, a bit of history, a bit of guilt (not as much as the National Museums of Guilt you see in some other guilty democracies, but still feeling sort of bad about how the First Nations here were treated, but not so bad that the right thing is actually done by the government). Also exhibits about history of settlement, but nothing you don’t see in other Australian Museums. 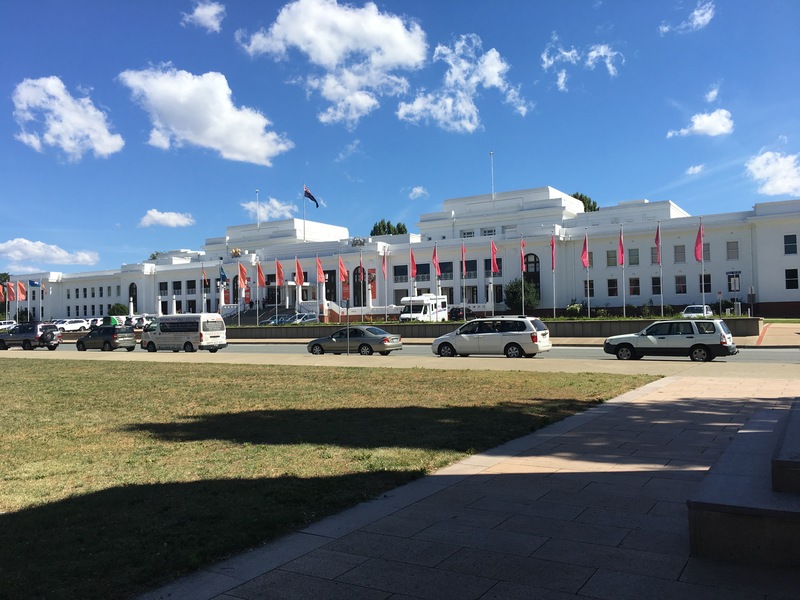 Museum of Australian Democracy – This occupies the old Parliament House, which is a surprisingly small building for a national Parliament (smaller than many statehouses in the US). Australia in its short life has already purchased a Parliamentary upgrade to create a more symbolic building. The ground floor has a nice exhibit of recent political cartoons (probably better in book form, but still interesting). The upstairs has interesting exhibits about Prime Ministers of Australia, as well as preservation of how the building functioned in its later days (Press room, Speakers Offices, etc.). The Museum also displays and preserves the two Houses. First to note is how to say this name. Apparently there is agreement about neither the pronunciation (I have heard it pronounced both Can-bra or Can-ber-ra) nor the etymology. Perhaps it is from an aboriginal ( Ngunnawal) word meaning meeting place, or the space between women’s breasts (it is in a valley), or prosaically from the word Cranberry, which was grown in the valley. The second thing to note is the flies. The tourist board doesn’t advertise this, but the flies in Canberra are extremely friendly, and numerous. They land on you, attempting to gain your affections, but in reality it is a form of harassment. The sweatier you are, the more amorous they become. They will even sit on your glasses to get your attention. [I could make some joke about Canberra, politics, and flies, but I didn’t.] Speaking of flying insects, there are also many clouds of gnats, but they go to their own club, and aren’t really interested in you, just annoyed that you didn’t get off of their cloud. The mosquitos don’t seem to have settled here. Perhaps it is too dry. Perhaps we were fortunate and missed them. Third to note is that the trees in Canberra don’t provide shade. There are many trees. However in general the leaves are too small. This is unfortunate as the summer in Australia gets hot. Hotel Hotel – Not where we stayed. 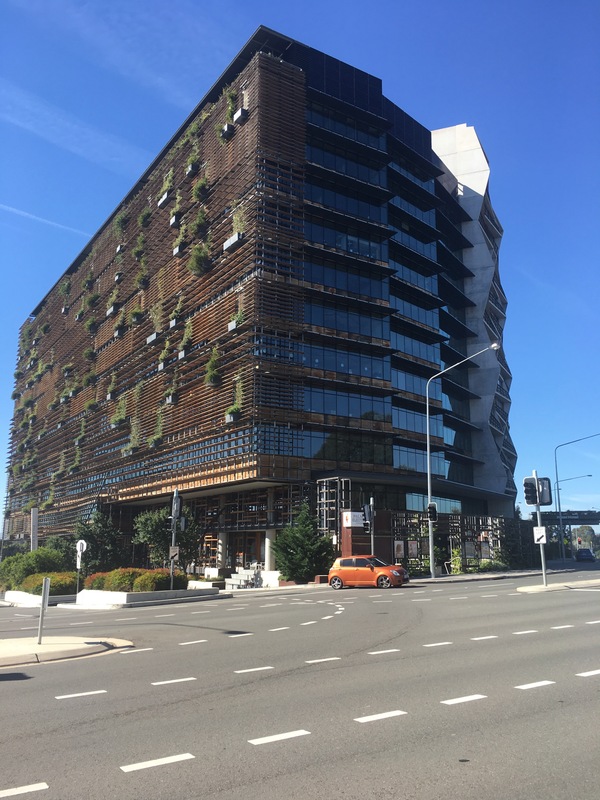 A Green Building, but no shade. Fourth, Summernats, a big Australian car show, was in town, and there were people and their classic vehicles driving around town, but not being car owners, or aware of this in advance, didn’t visit the show. Apparently there is a parade which we missed. Note, since this is summer holiday, government was not in session, and I think the employees were on holiday as well, so maybe the town pops more during session.